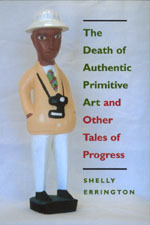 In this lucid, witty, and forceful book, Shelly Errington argues that Primitive Art was invented as a new type of art object at the beginning of the twentieth century but that now, at the century's end, it has died a double but contradictory death. Authenticity and primitivism, both attacked by cultural critics, have died as concepts. At the same time, the penetration of nation-states, the tourist industry, and transnational corporations into regions that formerly produced these artifacts has severely reduced supplies of "primitive art," bringing about a second "death." Errington argues that the construction of the primitive in the nineteenth and twentieth centuries (and the kinds of objects chosen to exemplify it) must be understood as a product of discourses of progress—from the nineteenth-century European narrative of technological progress, to the twentieth-century narrative of modernism, to the late- twentieth-century narrative of the triumph of the free market. In Part One she charts a provocative argument ranging through the worlds of museums, art theorists, mail-order catalogs, boutiques, tourism, and world events, tracing a loosely historical account of the transformations of meanings of primitive art in this century. In Part Two she explores an eclectic collection of public sites in Mexico and Indonesia—a national museum of anthropology, a cultural theme park, an airport, and a ninth-century Buddhist monument (newly refurbished)—to show how the idea of the primitive can be used in the interests of promoting nationalism and economic development. Errington's dissection of discourses about progress and primitivism in the contemporary world is both a lively introduction to anthropological studies of art institutions and a dramatic new contribution to the growing field of cultural studies. Shelly Errington is Professor of Anthropology at the University of California, Santa Cruz, author of Meaning and Power in a Southeast Asian Realm (1989), and coeditor of Power and Difference: Gender in Island Southeast Asia (1990).